Much more mild in flavor and aroma than the italian truffle sea salt. This has a much more mild flavor and aroma. 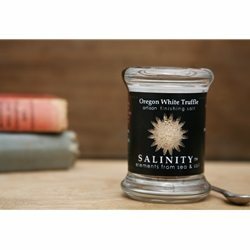 Our Oregon White Truffle finishing salt boasts aromatic fragrances of musk, cedar and nutmeg. It is creamy and envelopes the entire palette. Finish on soft and aged hard cheeses, lobster, crab and dishes that showcase butter, cream, leeks and garlic. Using only sel gris (grey salt) from the coastal town of Guerande, France. This salt has a high moisture content, (making it perfect for infusions), a lower sodium level, and an extremely high mineral content. This salt is very good for you! Below is a plethora of information that will help you understand the benefits of sel gris, and more. Enjoy feeding your brain! Sel gris is an unrefined and hand harvested (artisan) salt. Unlike industrial salt, it is not bleached, nor does it contain anti-caking or whitening agents (what salt should?). Paludiers, or salt workers, use large wooden rakes to harvest the salt from the salt ponds off the coast of Guerande, France in an ancient Celtic method. The ponds are lined with a thick clay soil that lends the salt it's grey color and high mineral content - up to 82 essential trace minerals and nutrients. The salt is also harvested at the perfect salinity level, approximately 85%, keeping the taste mild and delicious, especially when compared to industrialized salt that strives for a 99% salinity content.